During a speech to mark the 40th anniversary of the revolution that brought the Islamic Republic of Iran to power, Iranian president Hassan Rouhani said that Iran would continue its missile program. “Today, the whole world should know that the Islamic Republic of Iran’s strength is far greater than the days of the (Iran-Iraq) war,” he said in a supposed show of military strength. “Today our armed forces are self-sufficient in providing all types of weapons and ammunition. Today, 85% of our equipment and ammunition are produced domestically. We will not and have not asked permission from anyone to build a variety of anti-aircraft missiles, air defense missiles, surface-to-sea missiles, sea-to-sea and surface-to-surface missiles,” he said in Tehran’s Azadi Square during the regime’s 40th anniversary march. Rouhani vowed to “continue its military capabilities” adding that Iran’s military might “had astonished the world in the past five years”. In a statement to mark the regime’s 40th anniversary, Iran’s Revolutionary Guards Corps also stressed that it would continue to “develop” its missile program and “aid the resistance front and Islamic states” without “any regard for the conspiracies of the enemy”. The President of the Islamic Republic also praised Iran’s theocracy saying that it was the “Islamist” aspect of the regime that was “able to save the state in the face of dangers”. Rouhani said that Iran “was a real democracy” with press freedom. “Today in our society has a real democracy. Parties, magazines, and newspapers have freedom,” he said. What Rouhani calls “parties” are the various factions of the regime who have all sworn allegiance to the all-powerful Supreme Leader of Iran. Amnesty International recently said in a report titled, Iran’s Year of Shame that just in 2018, more than 7,000 dissidents were arrested in Iran. “Over the course of the year, more than 7,000 protesters, students, journalists, environmental activists, workers and human rights defenders, including lawyers, women’s rights activists, minority rights activists and trade unionists, were arrested, many arbitrarily. Hundreds were sentenced to prison terms or flogging and at least 26 protesters were killed. Nine people arrested in connection with protests died in custody under suspicious circumstances,” Amnesty said. The Iranian government commemorates the establishment of the Islamic Republic every year with rallies in Tehran and other major cities. 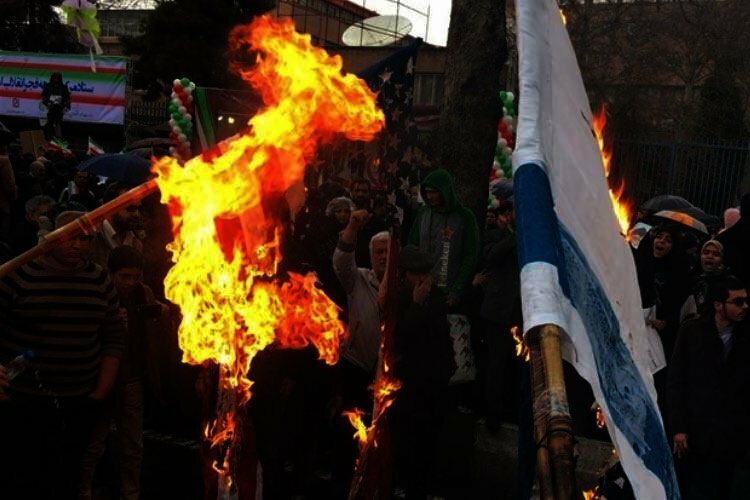 As usual, pictures published by Iranian news agencies showed pro-regime demonstrators burning US and Israel flags on the street. The IRGC stationed missiles on the route of the march in Tehran while chants of “death to America” and “death to Israel” were heard blaring over loudspeakers on the streets. The regime says that the numbers of participants in the rallies is a litmus test for how much support it has. This year, Iranian state run media boasted a large turnout while Iranians on social media posted pictures and videos of low turnouts in various regions of Iran. More footage of the regime's "massive rallies" marking the 40th anniversary of the 1979 revolution. Despite all the regime's propaganda, these marches are boycotted by the Iranian people. The rallies are largely shunned by ordinary Iranians though many government employees and school children are forced to participate. Poverty stricken people from other regions are also brought in with buses to Tehran to take part in exchange for the day’s food. These people just want a piece of cake. Ridiculing the regime, they care nothing about today's rally marking the 40th anniversary of the 1979 revolution.